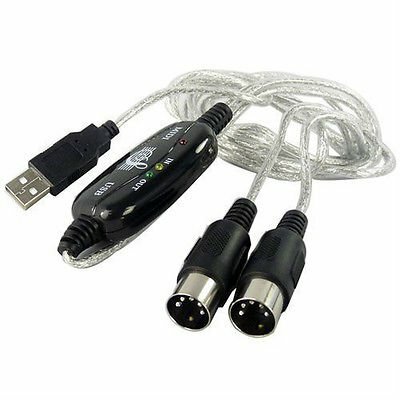 USB to MIDI keyboard Interface Converter In/Out Cable. Simply connect the USB cable into your computer, and your MIDI interface connection is completed. Easy to turn your PC into a music studio, start by connecting a music keyboard to your computer with the supplied USB MIDI Cable. High quality product, Brand new. USB powered and Class Compliant for true plug & play. 1 in + 1 out MIDI interface; 16 MIDI input channels ,16 MIDI output channels. LED's indicate power on, MIDI in signal and MIDI out signal. Make Music recording by connecting a music keyboard to your computer with the USB MIDI cable with input/output. Cable length: 6 feet (about 192 cm). SATA Adapter USB 3.0 Cable For ASUS EP121 UX21 UX31 SANDISK ADATA XM11 SSD 2.5"